PHOENIX, September 8, 2010 (GLOBE NEWSWIRE) -- iMergent, Inc. (AMEX:IIG - News), a leading provider of e-commerce software, site development, web hosting and search engine optimization for businesses and entrepreneurs, discussed results of a contest they held at Brigham Young University (BYU) where students were provided free website hosting and a chance to build and run an e-commerce website using the Crexendo web building platform. All the students who entered the contest were full time students and were required to carry a full course load. Seventy student teams entered the competition, 17 completed and published websites by the contest deadline. The results showed that 13 of those 17 teams managed to in the contest time develop an e-commerce website which was profitable. All the teams were allowed to retain their website after the contest and many are intending to continue to use their websites. The competition’s student lead, Thomas Gosney, said the competition motivated teams to try entrepreneurship in the form of online marketing. “As a critical first step in entrepreneurship, a website allows students to create a business without the large amounts of capital that other types of businesses require,” he said. First-, second-, third- and fourth-place websites won $8,000, $5,000, $3,000, and $2,000 respectively. Fourth-place winner Adam McMurtry commented, "One of the best things about this contest was Crexendo's execution. They taught us how to build a business from nothing, and get web presence in just 3 months. The execution on awards and prizes was incredible." Adam still operates his site and maintains a #1 position in his search rankings using what he learned from Crexendo. His site, www.SimplifyEngineering.com, sells a plug-in for Microsoft Excel that automatically converts units of measure. Perhaps the best example of lasting effects from the contest is its winner, Brady White. He and his teammate, Kyle Klein, built the site www.NoteSync.com to sell a computer application Brady had created. Since then they’ve had over 60,000 downloads and have signed on as an early partner in the Adobe Melrose project. It will enable them to sell their application as part of an Adobe storefront with other top applications. Third-place winner Devin Collier was working in marketing part-time while attending BYU and decided to build a website for a local chiropractor. He still operates a similar site because of his experience and says the chiropractor’s current success is directly attributable to the Crexendo contest and tools. Curtis Heyman and his partners, Shane Larsen, and Dustin Cook, didn’t win the contest but managed to use the site they built to pull in about $35,000 of new business for a pool maintenance company. The business owner still gets leads from the site. “The customer support played a big part in helping us complete the project,” said Curtis. You can still see the site they built at www.AZPoolRepairService.com. Partly because of the work Curtis did on that website, Crexendo hired him shortly after the contest ended. Competing websites were scored on appearance (15%), mechanics (35%), marketing (25%), overall idea (25%), plus there was a bonus category called Traction, wherein contestants could earn up to 10% extra points for actual leads or sales their websites brought in. 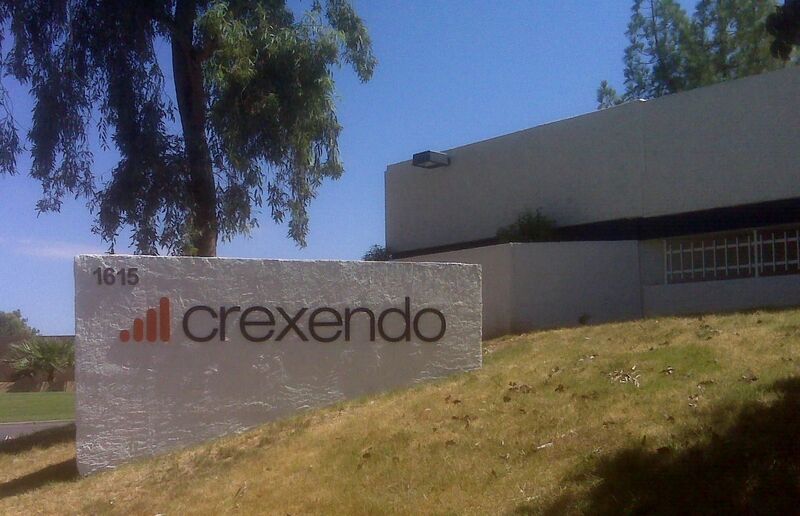 Crexendo intends to extend the contest to the University of Utah and California State University at Fullerton in addition to repeating the contest at BYU. The program is an ideal way to give students free experience in entrepreneurship and website-building. Orem, UT — August 13, 2010 — On August 11-13, Crexendo, a Web marketing services company based in Phoenix, AZ with offices in Utah, Nevada, Washington, and New York sent its 250 plus Orem, Utah employees to perform maintenance and repair work at Orchard Elementary School in Orem as their annual service project. Orchard Elementary services about 750 students. Crexendo President Clint Sanderson said, "It's important to be a good corporate citizen now more than ever. With budgets so tight for everyone, this is a good way to give back to the community. It gives the local kids a nicer place to go to school and we enjoyed getting out of the office to do it for them." Crexendo has done service projects like this in the past and Sanderson says they plan to do many more in the future. Orchard Elementary Principal Barry Bezzant can be reached for comment at 801-358-2424. Orchard Elementary is located at 1035 N. 800 E. in Orem. Crexendo offers Web marketing services to companies who want more traffic and leads on their websites. They offer SEO, link-building, website re-builds, paid search management, analytics, and other services. 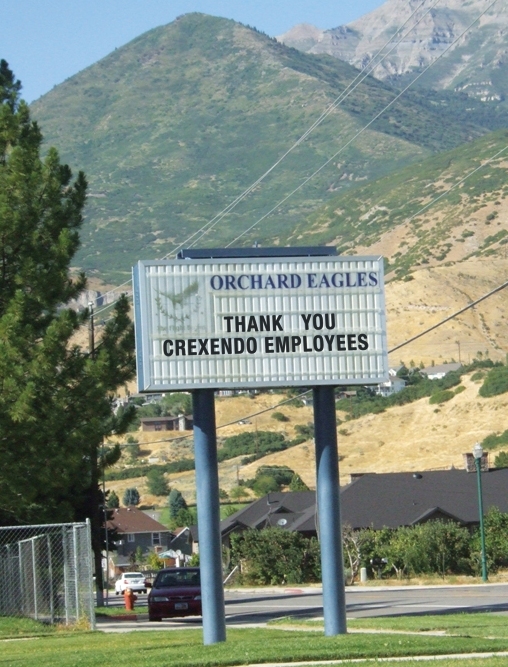 For questions about Crexendo, its services, or its project at Orchard Elementary, call Jeffrey Korn at 801-234-5988 x4630. Tempe, AZ – August 10, 2010 – Crexendo, a Web marketing services company based in the Phoenix area, recently moved to a new, larger building in Tempe, Arizona. It is 22,000 square feet with ample parking including 30 covered spaces. It has a 3000 square foot raised floor computer room that could become Crexendo’s second data center. The building is located in a business park with the Sheraton, Quality Inn, and Comfort Inn as neighbors. Before moving in, the company re-painted and re-carpeted the building, updated the plumbing and electrical systems, and upgraded the HVAC (heating/cooling) system. There are 10 offices around an interior core with space for 40 work stations. They added new furniture and interior and exterior lighting. The building also has a large break room with kitchenette, as well as a covered patio with outdoor tables and seats. The board room easily seats 14, and two smaller conference rooms seat 10 each. A new security system was installed and a major landscaping project is slated. The new location puts Crexendo headquarters closer to Sky Harbor Airport, Interstate 10, and Arizona State University. The Web marketing services Crexendo offers include paid search management, keyword research, SEO, CRO, site re-build, and much more. In addition to its home office in Tempe, it has offices in Salt Lake City, Seattle, Houston, Denver, New York, and Dallas. Orem, UT – July 26, 2010 – On August 11-13, Crexendo, a Web marketing services company based in Phoenix, AZ with offices in Orem, Nevada, Washington, and New York will send its 250 plus Orem employees to perform maintenance and repair work at Orchard Elementary School in Orem as their annual service project. 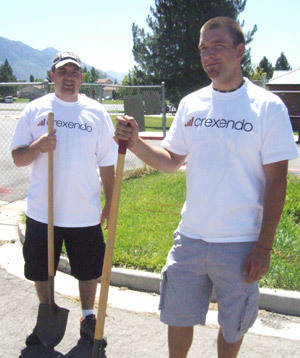 Crexendo President Clint Sanderson said, "It's important to be a good corporate citizen now more than ever. With budgets so tight for everyone, this is a good way to give back to the community. It gives the local kids a nicer place to go to school." Salt Lake City, UT – June 10, 2010 – “Just tough it out.” That used to be the only advice available to young asthma sufferers. In fact, a doctor once gave Clint Sanderson that very advice. Sanderson, now the President of Crexendo, a Web Marketing company, was a boy at the time, struggling to cope with asthma as he grew up in Wyoming. Perhaps that’s one reason Sanderson and the company he leads has been so involved with the American Lung Association of Utah and its Open Airways For Schools program. Open Airways For Schools educates asthma sufferers ages 8-11, some of whom might not learn about it any other way. It helps kids understand that by managing their condition, children with asthma can do anything non-sufferers can. “With today’s medication, most children with asthma can be confident about playing sports, being outdoors, and even being around animals,” said Hooper. Proper education about asthma is important for the children and their families but the issue reaches much further than that. “Knowing how to manage asthma often means the difference between a routine trip to the doctor and a rush to the emergency room. In terms of cost, that can be a difference of $400 or more,” Hooper said. In the case of kids who live in low-income households, that cost savings filters down to all tax payers. Especially because asthma attacks are a leading cause of emergency room visits for school-age children. And the percentage of asthma sufferers in the general population is on the rise. There are currently 33 elementary schools in Utah participating in the program and any school that would like to participate can still do it. The program is ongoing. Clint Sanderson is slated to begin his term as Chairman of the American Lung Association in Utah on July 1, 2010. PROVO, Utah – May 10, 2010 – In an age when most people go straight to the Internet for information, an effective website is key to a company's success. Getting students to understand that reality and teaching them how to create and implement effective internet marketing strategies was the goal of the inaugural Crexendo Online Marketing Competition, which culminated in an awards ceremony May 9. Master of information systems management students Brady White from Orem, Utah, and Kyle Klein from Provo won both the $8,000 first-place prize and the audience choice award for the website they built to sell NoteSync, a computer program for synchronizing to-dos and other notes with Google Docs. The team also received four tickets to a Utah Jazz playoff game and a year of free web hosting from Crexendo. "The competition forced us to think outside the box and look for new ways to do online marketing," Klein says. "We had to build everything from scratch, but that gave us a chance to make the site look really good." More than 70 BYU student teams entered the competition, which was narrowed down to eight teams who presented their websites and marketing plans at the awards ceremony. Teams used Crexendo's e-commerce content management system to build their sites and create a web presence. A panel of three judges, consisting of a Marriott School professor, a Crexendo employee, and a third-party consultant, then selected winners based on each site's appearance and mechanics along with the team's business model and marketing plan. Thomas Gosney, the competition's student lead and a senior studying manufacturing engineering from Kingston, Washington says the competition helped motivate teams to jump into entrepreneurship and the exciting world of online marketing. "As a critical first step in entrepreneurship, a website allows students to create a business without the large amounts of capital that other types of businesses require," he says. "It's a simple step that almost anyone can take." Second-place team Leading Electric, third-place team CzechMate, and fourth-place team Engineering Paradise each won $5,000, $3,000, and $2,000, respectively. The event was hosted by the Rollins Center for Entrepreneurship and Technology and sponsored by Crexendo Business Solutions Inc. Crexendo president Clint Sanderson says he looks forward to the future of the competition and the prospect of helping students start successful online business ventures. "We are excited about enabling future entrepreneurs and technologists with the tools needed to start an online business," Sanderson says. "We hope to inspire and recognize creative thought in an area essential to fostering workforce readiness, financial management, and economic well-being using the Internet." The Marriott School is located at Brigham Young University, the largest privately owned, church-sponsored university in the United States. The school has nationally recognized programs in accounting, business management, public management, information systems, and entrepreneurship.